A week ago I posted my last Beetroot and Lentil Salad, just before I got onto the plane to Germany to run the Berlin marathon. And now it's all over and done. First things first: I did the race, my injury didn't play up. My finish time was 3:18:11, a PB by 8 minutes. I finished 202nd woman out of almost 9.000 and was 39th in my age category. I am very very pleased with that. It was an awesome experience. Realizing that I was lining up with 36.000 other runners between Brandenburg Gate and Siegessaeule, two of the big Berlin landmarks, to run the 40th Berlin marathon got me almost emotional. It was freezing cold, 6 degrees (43 Fahrenheit), but clear blue sky. I had followed the weather forecast for a week leading up to marathon day. While I was looking forward to sunny weather, 6 degrees were pretty cold. When I arrived in Berlin on Friday morning, I realized that I hadn't been in such cold weather for almost 10 years, never mind running in it. I bought some cheap gloves to wear during the run, and decided to stick to my usual short pants and vest only. I had family and friends positioned along the course at agreed spots. That was a good idea because for the 10-12k runners were still going in big crowds so that spectators had to scan through thousands of faces to detect their loved ones. Up until halfway mark it was me spotting my supporters on the roadside and shouting out to them, not the other way around. I got a little frustrated over the first 10k as I couldn't run the paces that I wanted because of the crowds. The water stations were chaotic too, and I soon had to throw away my gloves, as wet gloves don't keep warm. I felt most comfortable between 20 and 30k. At 32k I suddenly realized that it was not long to go to the finish line. "Only" another 10k. My father was at the roadside at around 38k, and I thought it was about time to mobilize whatever was left in me with just 4k to go. There is nothing better than finish with style, and, as a lady, overtake as many men as possible, just before the finish line. My last km was also my fastest with 4:18. If someone had told me just 6 months ago that I could run this pace at the end of a marathon, I would have declared him mad. Just behind the finish line, the organizers of the marathon had put up a board announcing the times of the fastest men and women and that Wilson Kipsang had set a new world record. It's actually no point comparing his run with mine, but I do it anyway: My average pace was 4:41min/k while his was 2:55min/k. I don't think I could keep up with him for more than a few hundred metres. And guess what my first refueling food item was: a beer. In fact, I had two beers before I moved on to solid foods. Which was fatty junk food. There is a time and place for everything. Running a marathon in personal best time in an awesome city with awesome spectator support was reason enough for me to throw my healthy diet overboard for the day. Now, 5 days later, I have replenished whatever was lost during the race. I was very hungry for a few days. By now things have gone back to normal. I still try and include the extra portion of proteins to help my sore leg muscles recover. 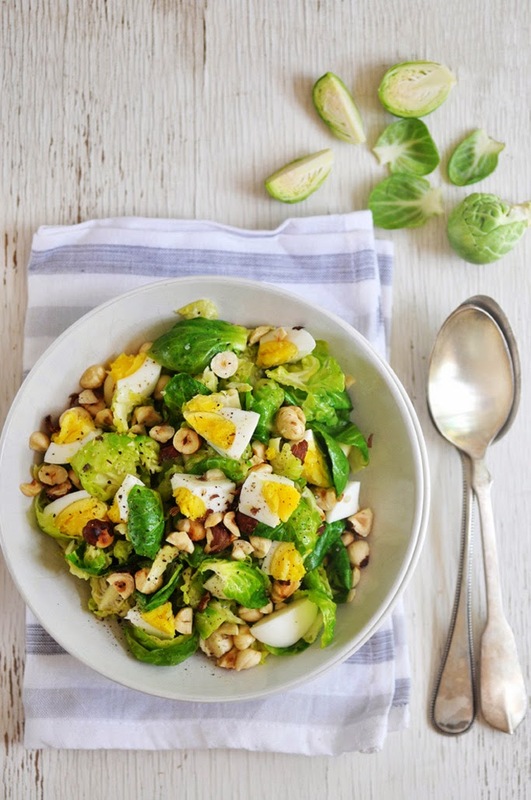 Therefore, today's recipe is a salad packed with proteins from the eggs, healthy fats from the hazelnuts and all the goodness of green leafy vegetables from the brussels sprouts. Very nutritious, filling and satisfying. And incredibly delicious of course. I hope you enjoy. Taking one brussels sprout at a time, peel back the individual leaves until you get close to the center and you can’t peel anymore. You may either discard the center or cut in half. Place all the leaves a bowl and set aside. Toast hazelnuts in a dry pan over medium-low heat for 6-8 minutes, or until skin starts peeling off. Take off the heat, Let the nuts cool a little and rub off the skin as soon as you can handle the nuts. Chop nuts and set aside. Heat olive oil in a large skillet over medium heat. Add garlic and sauté until fragrant, about 1-2 minutes. Add brussels sprouts leaves and sauté until slightly wilted or lightly browned. Remove from heat. Add the chopped hard-boiled eggs, chopped hazelnuts and season with sea salt and freshly ground pepper.